2010 has been an incredible year for the blog. I appreciate everyone’s support of Own The Dollar. I have big plans for the blog in 2011. I want to continue to grow the blog over the next year. Thank you so much for all of your support over the past year! Here are my main goals to achieve by December 31, 2011 for Own The Dollar. Alexa Ranking: Own The Dollar has an Alexa Ranking of 543,000. I would love to drop it down to 250,000.which would be very aggressive over the next year. Visitors: The blog currently has over 10,000 visitors per month. I would love to triple that number over the next year. Feedburner Subscribers: My goal is to add 1,000 subscribers throughout next year. MoneyCrashers ranking: Own The Dollar is currently ranked 302nd in Money Crasher’s ranking of personal finance blogs. My goal is to get Own The Dollar to under 150. Facebook: Currently the blog has 57 Facebook fans. I would love to see that over 100. This is definitely an area that I have been slack on. I will continue to post updates throughout the year as I attempt to meet these goals for the blog. 5. Email a great article you find to a friend. Find an article here that you think one of your friends would love? Feel free to e-mail a blog posting to them! You can e-mail it to them by using the button at the bottom of this post. Or, print it out and post it around the office water cooler! 6. 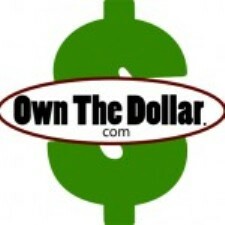 Write a review of Own The Dollar on Technorati. Best of luck with your blog goals. They are kind of similar to mine. I think they are definitely possible. With the power of the Yakezie network you should reach them in no time. Good luck with your goals Hank! I have similar goals but I am a much younger blog than you 🙂 I will visit from my home computer often to help with your Alexa goal. Liked you on facebook as well. Great luck with your goals, Hank. I dont see the badge anywhere, but I was wondering if you’re a member of the Yakezie. A drop of that stature shouldnt be any problem at all if you are. If you’re not, consider joining! Previous post: Are You Making Any New Year’s Money Resolutions This Year?